Robert Ferraiolo Wicks was born in Brooklyn, NY on April 30, 1902 to Italian parents. After finishing elementary school he drifted to Coney Island and started painting shooting galleries with John and Frank Mc Cullough. In these early years Wicks made a name for himself working with several banner painters. 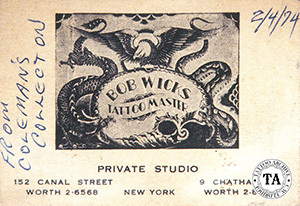 Wicks started tattooing in Coney Island in 1916 or 1917. 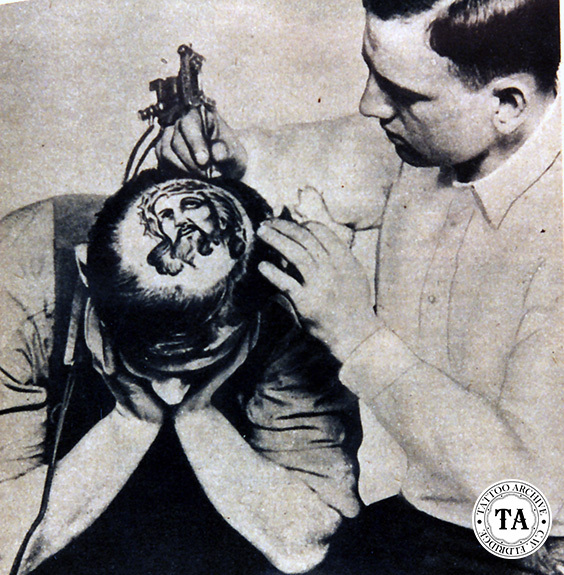 It is unknown who Wicks learned to tattoo from, but around this time there were many tattooists working in Coney Island. Within a year Wicks was teamed with Burt Thompson, a balloon jumper and tattoo artist. Thompson's tattoo studio was a good-size cabin cruiser and he worked the waterfronts of coastal towns. After working several weeks with Thompson near Chatham Square, Wicks was sent for by Charlie Wagner and spent the next five years working at Wagner's #11 Chatham Square shop. That shop was described by Wicks as a 5x8 corner in a barber shop rented from Louis Alteresi, who owned the barber shop and was also bail bondsman. By this time Robert Wicks was better known in the tattoo and show business world as "Texas Bobby Wicks". It is a mystery how he got the Texas nickname because it was said that he was never west of Ohio. While at #11 Chatham Square, Wicks and Wagner tattooed each other and by the age of 19 Wicks was billed as America's youngest tattooer. Wicks spent at least one season with the Dobyns & Bergen Show in 1921, probably working as a artist/attraction. After leaving Wagner's shop Wicks operated two other shops in New York City; one at #152 Canal Street and another at #9 Chatham Square where he was located in the back room of a barber shop and worked with Andy Sturtz. With the stock market crash in 1929 and the start of the depression, Bobby Wicks quit tattooing and turned back to his first love - banner and show painting. This change was not surprising because almost all of the tattooers in New York City were awed by Bob Wicks oil paintings. In the early 1930's Wicks started painting scenery and show fronts for carnivals like the Royal American Shows. The Royal American Shows, owned by Carl Sedlmayr and the Velare Brothers, was often billed as The Greatest Thing on Wheels and The Worlds Largest Midway. Bobby Wicks traveled with Royal American for many years and worked his way up to designer, decorator and superintendent of the paint department. During this time Wicks designed a crest for the show that was used on employees' uniforms, tickets boxes, wagons and trucks. Bobby Wicks retired from banner painting around 1972, but continued easel painting and occasional show fronts. He said, "My easel paintings yield a better income by far, and there is no deadline as with banners"
Very little of Bobby Wicks tattoo flash have survived but looking at those surviving sheets, it is clear that he was one of the great flash painters/tattooists of his era. Perhaps of any era.